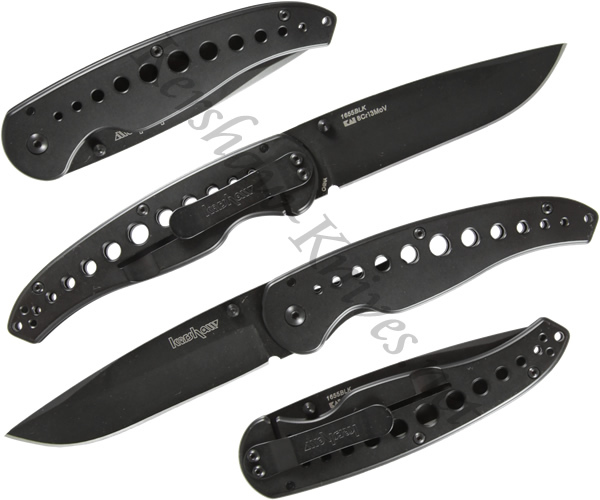 The Kershaw Black Vapor III find edge knife model 1655BLK features a 3.5 inch fine edge blade. The whole knife is coated in black oxide for a non-reflective tactical look. Thanks to the drilled and lightened handle, this knife weighs only 4.2 ounces but operates like a full-fledged large folding knife. One-handed opening is a breeze with the Kershaw 1655BLK because of the ambidextrous thumbstuds on the blade. The frame lock locks the blade nice and tight while also making use of the parts already on the knife without introducing new ones. The Kershaw Black Vapor III has a low-profile pocket clip where you can easily carry the knife on the inside or outside of your pocket.